Can you say gully washer? Or, frog choker? People attending the May coin show enjoyed rain and thunderstorms throughout the day - at times, very heavy rain, too. One dealer driving down from the north Georgia mountains in the early morning decided the rain was so heavy and the road so difficult to see that he'd rather return home. Another dealer called to ask if the weather was going to cancel the coin show. No, we do not cancel coin shows due to the weather. On occasion, weather prevents people getting to the show, but we do not cancel. Only once in 25 years we couldn't get to the show because of heavy ice. The good news is the weather is nice most of the time in our area (if we don't consider heat and humidity). On this rainy May Sunday morning, coin dealers filled the coin show's bourse with their displays of coins, currency and other collectibles - mostly numismatic collectibles. Here's a welcome-and-we're-glad-you-came to a visiting dealer from Jacksonville on his way home from the Gallatin, Tennessee coin show. He set up in lieu of the gentleman with the dangerous driving conditions. Well, the wedding party did move indoors, but the coin show was held in its normal rooms of I and II. People visiting the show observed the wedding party and their guests dressed in their finery roaming the lobby area in the afternoon. In a jocular mood, one of our dealers yelled, "Don't do it!" Someone laughingly replied, "It's already done." Interestingly, a two-coin set was popular at this month's coin show. Popular is a relative term. In this case, a couple of people brought their sets to sell to one of the dealers while other individuals came to the show looking for this specific set. 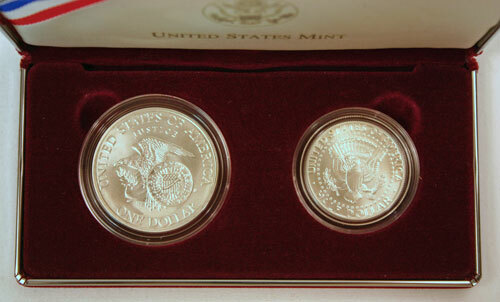 The two-coin set's mintages are not listed in the Red Book and not readily available on the US Mint web site. But, just based on the lack of sets bought and sold among the dealers, the set is somewhat rare. OK, what set are we talking about? 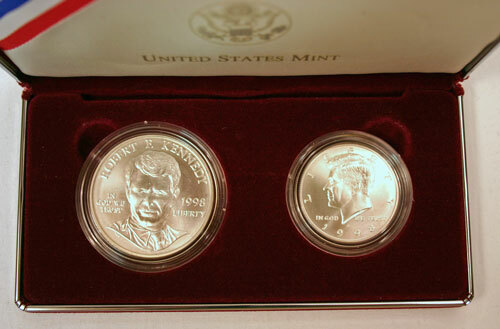 It's the Kennedy Collector's Set with an uncirculated Robert F. Kennedy silver commemorative dollar and a matte proof John F. Kennedy silver half dollar coin. In other words, we had a full house of dealers for the many people who came to the show despite the rainy weather. And, most of the time, the weather was just rain not heavy storms for which we are thankful. As always, we very much appreciate and send a thank you to all the people who visit the coin show and make it fun and entertaining for all. This month, hotel personnel told us the coin show would to be in the right portion of the Joe Mack Wilson ballroom in rooms II, III and IV. This was necessary due to a wedding party that needed to move indoors for the weather. This two-coin set is not cheap and certainly not the most expensive set, but the Kennedy family portraits still provide collectible interest in numismatic circles. It's just fun and interesting that several changed hands during the May coin show. Of course, the coin show provided a wide variety of interests in both coins and currency this month. Our visiting Jacksonville dealer displayed a broad collection of currency, which is his specialty. Our regular dealers showed off their variety from the ancients to the colonial to the modern era coins along with jewelry and other collectibles. Next month's coin show should be just as interesting as the metals markets continue their odd something-is-wrong-somewhere behavior and the dealers continue to display their wide numismatic interests. Mark your calendar and make plans to visit the next Greater Atlanta Coin Show on Sunday, June 9, 2013 to buy, sell and browse the wide variety of numismatic and collectible items. 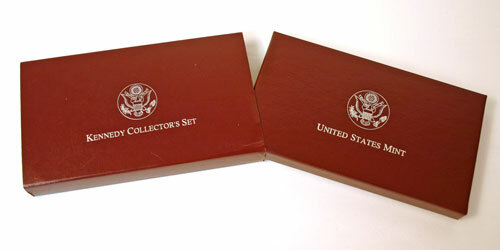 The set includes a burgundy US Mint box held inside a slip sleeve with Kennedy Collector's Set on the front. The inner box holds a velvet covered clam shell with a metallic heraldic eagle emblem in the lower right corner. 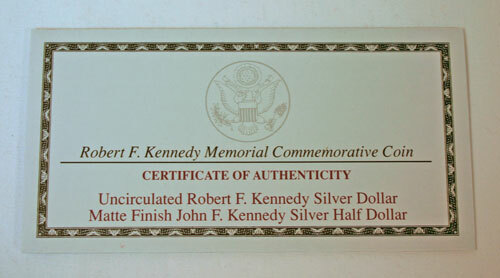 The front of the Certificate of Authenticity lists the two coins in the set. Inside the clam shell, the obverse of the two coins shows the Robert F. Kennedy portrait on the uncirculated silver commemorative dollar and the portrait of John F. Kennedy on the matte proof silver half dollar. Turning the protected coins over, the reverse images show different versions of eagles. Frank Gasparro designed the reverse of the John F. Kennedy half dollar, which shows the presidential coat of arms with its heraldic eagle. For the Robert F. Kennedy reverse, Thomas D. Rogers included the Seal of the Department of Justice and the Seal of the United States Senate to honor and remember Robert F. Kennedy's service in both.